Prior to the invention of Liberty Bell, there still were some other mechanical gambling mechanisms like, for example the machine constructed on the basis of poker cards manufactured by New York Company called Sittman and Pitt Company. However, the main recognition was won by the American inventor that officially designed slots machine the way we know it nowadays. The machine was named Liberty Bell. 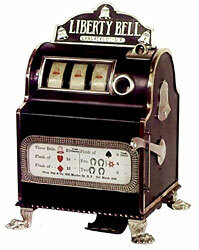 Liberty Bell was the first self-repaying mechanism in the gambling history constructed in 1895. It had three reels with the ten symbols displayed on them. Mainly, the reels contained diamonds, spades, bells and hearts. Due to the bell inscriptions, the apparatus was called Liberty Bell. The symbols were sure thing, different from the modern fruit symbols. In addition, there are some versions of slots design in the slots history which state that the machine acquired its name due to the fact that the first slots produced the sound of ringing bell in case of winning. The great history of Liberty Bell was set with its foundation. The Liberty Bell foundation was not so easy for its father - Charles Fey. It took some time before the invention gained the public recognition and bring fame to its inventor. However, the invention events were aggravated by the legislation issue that could not let Fey patent his own brainchild. Because of that he was made renting his machine to the local gambling establishment, saloons, pubs, etc. It was possible only by/when charging fifty % commission. In addition, Fey had to resort to using chewing gums or drinks rewards to avoid the problems with gambling laws that banned any gambling machines. In addition to the legality issues some supporting cheating problems emerged after the slots foundation. Besides, with the flow of time the gamers learned the slot machine cheats methods. They particularly cheated by means of the fake coins. In order to avoid the problem, Fey had to invent another anti-cheating means - detection pin that distinguished the fakes from the real coins. The anti-gambling laws that in addition were piggybacked on the abstention movement aggravated the Fey's business and turned out to be the real trouble for him. Slots very soon were proclaimed outside the law in San Francisco in 1909 and later on, in 1910, in the Nevada State, as well. It was surprising that by the year 1911 all slots were already prohibited by the California State. By the way, in the 30s to be anti-gambling oriented became politically popular, especially anti-slots oriented.